Harold Lloyd has been called the third genius of silent film comedy. The films of Charles Chaplin and Buster Keaton may be better known to modern audiences, but Lloyd's films are equally as innovative and entertaining as those of his famous contemporaries. While Chaplin was the master of pathos, and Keaton deftly battled the machinery of the modern age, Lloyd's Great Plains sensibility allowed him to mine the humor found in day-to-day experiences. His Everyman character paid tribute to the resiliency of the American spirit and the wisdom of everyday people. Harold Clayton Lloyd was born on April 20, 1893, in Burchard, Nebraska. His father, James "Foxy" Lloyd, was frequently unemployed, requiring the Lloyds to move constantly. Harold acquired his mother Elizabeth's love for dramatics, and when he was twelve years old he performed with a traveling stock company directed by John Lane Connor. In 1910 the Lloyds divorced. Harold and his father moved to San Diego, where Harold once again studied drama with Connor, his mentor. Lloyd's film debut came in 1912, when he landed a small part as a Yaqui Indian in the Edison Company's production of The Old Monk's Tale. In 1913 Harold moved to Los Angeles, where he performed in several Keystone comedies. He was also hired as an extra at Universal, becoming friends with another aspiring filmmaker, Hal Roach. When Roach opened his own studio in 1914, he hired Lloyd to play a character named Willie Work in a series of comedy shorts. Willie Work was quickly replaced by Lonesome Luke, a Chaplinesque character who wore tight-fitting clothes and sported a twopiece mustache. In 1916 and 1917 Lloyd and Roach produced more than a hundred of the Luke action comedies, but Lloyd was never completely satisfied with the character. In 1917 he devised a new character who wore normalfitting clothes and the black horn-rimmed glasses that soon became Lloyd's comic trademark. A series of short comedies starring Lloyd's new character, often referred to simply as Harold, or "the Boy," soon made the comic star the highest paid actor in Hollywood. In 1921 Roach and Lloyd produced their first feature film, A Sailor-Made Man, and Lloyd began outdrawing both Chaplin and Keaton at the box office. In 1923 Lloyd married Mildred Davis, his leading lady in several films, including the masterpiece Safety Last, filmed that same year. Also in 1923 Lloyd and Roach parted company on friendly terms following their final collaboration, Why Worry? Lloyd began producing his own films for Pathé and later for Paramount. One of Lloyd's biggest commercial hits, The Freshman, was released in 1925. In 1929 Lloyd made the transition into sound films with Welcome Danger, but his style of gentle, optimistic comedy was poorly received by Depression audiences. Lloyd made his final film, Mad Wednesday, in 1947. In 1952 Lloyd received a special Academy Award inscribed to a "master comedian and good citizen." In 1962 Lloyd produced a compilation of his work entitled Harold Lloyd's World of Comedy, which he presented at the Cannes Film Festival to a rave response. During the 1960s Lloyd traveled to colleges and film festivals, introducing his work to new audiences. Harold Lloyd died of cancer on March 8, 1971. He left behind over 200 films, more than Chaplin and Keaton combined, documenting his extraordinary contributions to American film comedy. Brownlow, Kevin, and David Gill, producers. 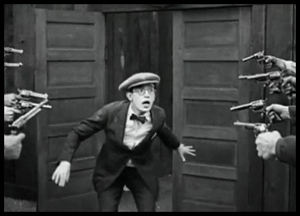 Harold Lloyd: The Third Genius. Thames Television Production, 1989. Katz, Ephraim, ed. The Film Encyclopedia. New York: Harper Collins, 1994: 833–34.